Since April 25th, Lloyd EcoDistrict has been partnering with Genze and Go Lloyd to bring a fleet of electric bikes to several businesses in the Lloyd neighborhood. This program was created as a transportation solution in one of Portland’s most rapidly developing business and residential Eco Districts. Not only is the Lloyd E-fleet an investment in the health and happiness of employees, but will also contribute to the vitality of the Lloyd District as a whole by eliminating traffic congestion and greenhouse gas emissions. As we enter the final week for Cohort 1 of the pilot, we are excited to see how our participating organizations are interacting with the e-bikes. We are getting great feedback from the riders at Kaiser Permanente and Bonneville Power Administration. One employee from the BPA found that the e-bike was “an awesome way to spend a lunch hour” and that it allowed them to “get some exercise without coming back to work out of breathe.” What a super user! 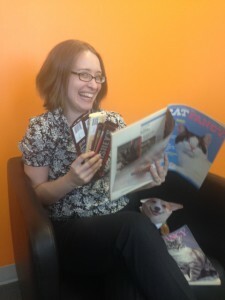 Courtney is super excited about the bribery chocolate that just got delivered by e-bike to the Lloyd EcoDistrict office. Devon likes to use the GenZe e-bike to take her corgi to the doggie day spa. Participants have a chance to win a basket of goodies from local businesses, including swag from Portland Design Works and Green Zebra Grocery. But time is running out, so get out there and ride! And stay tuned for more updates as we welcome our next round of participants – PacifiCorp, American Assets Trust, and the Kaiser Permanente West Side Medical Center.